Welcome to this week's jam-packed edition of Linky Love! As you may recall, I wasn't able to do a Linky Love post last week because the MckLinky Server was acting up. So first up, I want to share some fun entries from that Frugal Friday Linky Party. 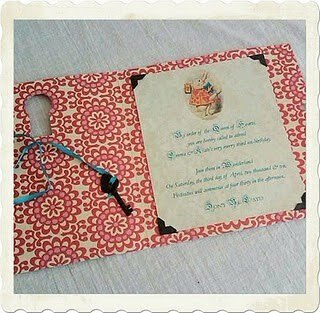 Tidbits from the Tremaynes shared her hotel key art. Such a fun idea! If you missed it, you can check out the other fabulous entries from this Frugal Friday party here. Now on to last week's fabulous party. You all never cease to amaze me. Here are a few of my favorites. Primitive and Proper shared this amazing sideboard transformation. I just love me some turquoise furniture...and this beauty is no exception. Wow. Less Than Perfect Life of Bliss shared stunning and simple butterfly punch art. Gonna have to pull out my butterfly paper punch after seeing this one! If you've been reading my blog for any length of time at all, you probably know that I have a bit of an infatuation with children's birthday parties. So you can imagine my glee when I found the most fabulous Alice in Wonderland birthday party ever at Tinsel and Company. It was so hard for me to narrow it down to just one photo to share, but I chose the lovely inviation. This is seriously a must see!! Perfectly Imperfect shared a fabulous chair makeover. Robin's egg blue damask + nailhead trim + white paint = true love! 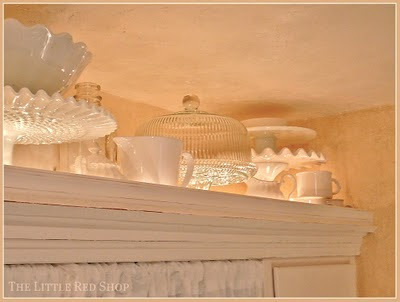 And last but not least, Little Red Shop showed off her kitchen's soffit transformation. Seriously amazing. No, I mean SERIOUSLY. Thank you to everyone who linked up this past week! I'm SOOO looking forward to this week's party! Thank you for inspiring me weekly with all your Frugal Decor Goodness. Ahh...thank you, Wendy! What a sweet surprise. You know what? All of your linky love selections would look quite nice at my house. Cute stuff! That chair is stunning! I love reading how people take what would be an expensive piece to purchase from a Potter Barn etc, and make it their own on the cheap! hi wendy! thanks so much for the feature! i am so glad you liked my sideboard. i love seeing everyone's projects and drawing inspiration- love all the key projects, and the chair, too! Ha! I just realized I typed the nashville part in your blog instead of the other one I had open. That's motherhood for you! Thanks again! What a wonderful Linky LOved! So glad I sopped in this morning. 'm forcing myself to "rest" after having some major dental work yesterday. Loving all the great key art.can't wait to try some. 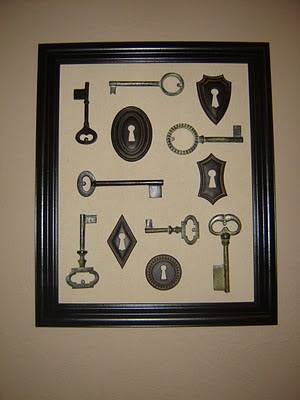 I love those skeleton keys! 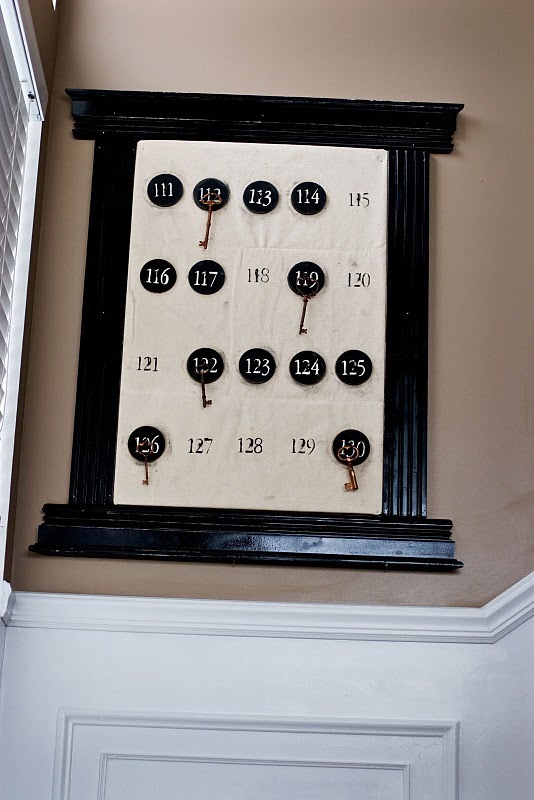 What a fun and easy way to decorate. Just linked over to your blog and I am loving it! Thanks. OMG love, love, love! I'm so glad I found your blog. LOVE the key artwork and love some of the pics you posted. Thanks for posting, now I've got some new projects to start! I really like all of the key art. So many fun and unique interpretations of one idea! And that blue turquoise dresser is really fabulous!